Any real estate purchase is tough to make, but this especially rings true when making a decision to buy Ohio farms for sale – requiring the buyer to come to a decision after weighing a multitude of pros and cons. Farmland is valuable, so if you make the right decision, you may have gotten yourself a quality investment. But if you don’t consider all advantages and disadvantages, you may have bought yourself a headache. Making the decision to research then buy Ohio farms for sale is undoubtedly tough; however, given the number of complex factors involved, particularly when it comes down to soil, can make your decision harder. Find out which factors you should pay attention to, below. 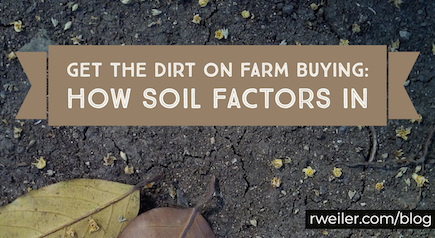 If you’re researching farms for sale in Ohio, you likely already know the importance of soil types. There is nothing more critical for the integrity of the farmland than the soil. As such, you’re going to want the results of the most recent soil tests; the results will inform you of the nutrients present in the soil, as well as the ones that are missing. You don’t want to spend a great deal of money only to find out there is a myriad of environmental problems plaguing the property; however, you’ll need to see how much of the farmland is tillable versus the amount that is not. If some of the farmland needs nutrients added in order to be tillable, or if part of the land just needs some work before it could be tillable again (known as reclaiming), you might be spending more in the long run than initially budgeted. Many top crops are grown on clay loam, a perfect mixture that has important nutrients and allows for water to pass through simply. Knowing what you’re paying for doesn’t stop at what’s on the property; it also concerns the foundation of the property. Making sure of the quality of the farmland you’re purchasing is above par will probably be the best decision you’ll make.